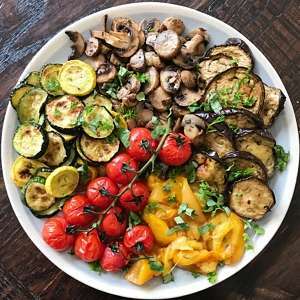 A colorful plate of roasted veggies brightens any table and offers something for everyone! Our Christmas Day dinner menu is classic Italian starting with a full antipasto course. The antipasto spread includes a Centerpiece Platter with Italian tuna, caponata, olives, marinated artichokes and roasted red pepper, a Caprese Salad, Cured Meats, and a big roasted Veggie Platter! This platter was from Christmas Day last year and includes: roasted zucchini, yellow squash, mushrooms, eggplant, yellow peppers and tomatoes. It was colorful, loaded with everyone’s favorites and so yummy! I roasted the vegetables on Christmas Eve and assembled the platter on Christmas Day to minimize the stress and work on Christmas so that I could enjoy the day more with my family. Plan ahead in terms of type and quantity of vegetables. Think of your guests and their favorite vegetables–You could even ask people what their favorite vegetables are ahead of time. That way you can make sure you have enough of the preferred vegetables. You could limit to the favorites but for a great looking platter it is recommended that you look at the colors of those vegetables and then add a few with different colors so the platter is balanced and vibrant in presentation. A roasted vegetable platter is always a good idea. It adds color, nutrients and works well with just about everything. Perfect for entertaining or for meal prep so that you have a stocked fridge ready for any meal. See tips for preparing ahead if entertaining on the post above. Zucchini & Squash- 30 minutes or until tender and just starting to crisp. This is about as simple and elegant as it gets. I have roasted veggies before but was looking for some inspiration for a dinner party. Perfect. Thank you. Thank you so much! Hope your dinner party goes well!